If you don’t count my grandmother’s crushed velvet bedspread or the beaded doorway of the bedroom of the prostitute who lived across the street, my life at age fifteen was largely devoid of glamour. I was just learning about perfume, and I’d saved enough from babysitting to buy a bottle of Babe, but I scouted the mall for something more sophisticated, something people who had passports and ate caviar might wear. Then, one day at the mall, I discovered Chanel. A saleswoman placed testers of Chanel Nos. 5, 19, and 22 on the glass-topped counter, but she pushed the bottle of No. 22 forward. “I think you’ll like this one,” she said. To me, Chanel fragrances were the epitome of chic. They didn’t need an elaborate bottle or television ads of a man pretending to be a prince in a puffy shirt to signal quality. I ended up buying the No. 22 bath oil. The oil was fragrant and much less expensive than the Eau de Toilette. (The prostitute had been terrible about paying her babysitting bill.) The inside of my wrists and behind my ears were well moisturized that year. Ernest Beaux created Chanel No. 22 in 1922, the same year Caron Nuit de Noël and another Chanel, No. 55, were released. The top notes are aldehydes, white roses, jasmine, tuberose, lily of the valley, lilac, and orange flower. The heart is orchid and ylang ylang, and the base is vanilla, incense, and vetiver. I clearly remember the bath oil’s square, white glass bottle and the lid’s silver band, dissolved slightly by oil, but I only had a vague recollection of its fragrance. A lot of scent and a few decades stood between me and Chanel No. 22. One whiff of the sample tube of Eau de Toilette a few days ago, though, and the scent came right back. As is true of the other numbered Chanels, the first hit of No. 22 is aldehydes. After twenty minutes, when the shrieking coloratura of the aldehydes fades, a gorgeous duet of white flowers — mostly orange flower to me — and gentle incense emerges. Imagine the heart-rendingly beautiful duet “Viens, Mallika” from Delibes’ Lakmé translated into scent, and you have the middle of Chanel No. 22. After an hour and a half or so, just the incense, grounded slightly by vetiver, burns along quietly. I don’t really smell the vanilla in the dry down at all, and the jasmine, ylang ylang, and tuberose are blended so that none of them stands out from the others. The whole show lasts about four hours and stays close to my skin. Overall, the scent is warmer and more interesting than its raft of white flowers might lead one to believe, probably because of its incense rather than the more usual vanilla, amber, or sandalwood. I sure was one terrific smelling teen. No. 22 is warm enough to save for cool weather, and could be a day or night fragrance, although it might be too pretty for work. My local Nordstrom carries Chanel No. 22 Eau de Toilette, and it’s available at gloss for $84 for a 100 ml spray. The parfum, which I’d love to try, is more difficult to find, but at least one online discounter has it for $92.99 for a quarter ounce. Sadly, I couldn’t track down the bath oil at all. Update: Chanel No. 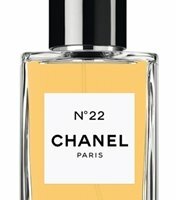 22 is now part of the Les Exclusifs de Chanel collection, $200 for 200 ml Eau de Toilette. What a lovely review, Angela! My first Chanel was #19, purchased for me by my Mom, around the time of my college graduation. It is still my favorite Chanel. Thanks for such pleasant reading! I havent tried the Chanel womens offerings, but their mens fragrances are pretty disappointing. Does Chanel still hold the same clout today in the face of powerhouse niches like L'Artisan, Lutens, Creed and MPG ? It seems like Chanel has the same sort of reputation, more or less, that a lot of the old fashion houses have these days. I seem to remember–but somebody please correct me–that Christopher Sheldrake, who created many of the Lutens fragrances, is doing work for Chanel nowadays. And although I do like No. 22 and have a huge nostalgic attachment to it, I actually like some of the men's Chanels better than the women's! C'mon…. it's Chanel! And Dior and Guerlain…. Monoliths in the fragrance landscape, rather like the Acropolis or the Eiffel Tower or the Statue of Liberty: Ageless, timeless, classic, not to be done without. That said: still good, too, even if they do turn out some crap every now and then….. Loved your review, Angela – I need to re-visit no. 22, I think. I didn't like it when I last tried it, being a dyed-in-the-wool 19 girl, but I'm coming around to vintage no. 5, so why not try 22? It might grow on me yet! And when I was a girl, in a dying timber town, Chanel was as close to god as you could get. The thought of seeing the Eiffel Tower in person (heck, even seeing Sacramento in person) was dizzying. I did a bottle or two of Coco in my twenties, too, still in the thrall of Chanel. I know I have a few Chanel samples, but I don't even think I have a bottle of anything Chanel these days. I can imagine buying a quarter ounce of the No. 22 perfume for old times sake, though. And I'd love a bottle of Bois des Iles. Beautiful review. I've never tried No22. I don't think Chanel has produced anything of interest (or elegance) since Coco (which I bought the day it was released here, and wore for several years). The classic Chanels are superb. Thank you! Do try No.22, if you have the chance. The incense makes it something interesting, and you know enough about Chanel not to be scared off by the aldehydes. I hope to have the opportunity to do so in the near future. Me, scared of aldehydes? On the contrary, I love them. Then you'll definitely love 22! I need to do some sort of aldehydes de-sensitization program so that I can enjoy some of the fragrances I already love even more. What a wonderful review! It took me a long time to appreciate No.22 since until a few years ago I was a white flower phobe, but I've seen the error of my ways and this is just divine. I grew up abroad, but due to my DH's work have settled in a small town in the American South. The Chanels are infinitely helpful in making me feel more at ease there. White florals can definitely pack a punch, but No. 22 seems more subdued–although it is definitely a womanly fragrance. I love the incense in it. The South must feel a long way from where you grew up! A long time ago my wife wore it along with the dusting powder(no longer available sadly)-very girly indeed. I'm a redhead with pale skin, and when I first wore No. 22 I at least aspired to pastel dresses, so I think you've pegged the fragrance pretty well. How, Monterey Male, is it that you know perfume so well? Hmmm. I guess it starts with being a man who loves women. Maybe because my mother wore perfume and I loved my mother and her femininity. Maybe because I pay attention to smells as they evoke powerful memories as much as visual images. A woman's choice of perfumes tells me a lot about her simply by walking past her. I most commonly notice that many women wear the same perfumes-somewhat commonplace and ordinary. They must buy what they see advertised. They,apparantly,don't use thier own noses. Too bad. A woman wearing the “right” perfume can alter my consciousness. No kidding! It's rare but when it happens I am very surprised and I take another look and,for a moment, I am moved. I am equally “turned off”. Sometimes I am offended. I must sound elitist-I'm really not, I just love the experience of women who smell like women. I dont like mens colognes on women and I think 'UNISEX” scents completely miss the point. Oh well, I'm flattered that you think I know perfume. I know that I really do enjoy women who wear it. My favorite of all Chanel perfumes! I love how soothing it is. When I put it on it's often for moments when I want a scent to relax with. It reminds me in a way of baby powder because it's light and easy on the nose in way that subtly enhances your senses and soothes you completely. I find it soothing, too. For me a lot of its comfort is because it's such a familiar scent from so far back. What a lovely review! I wished No. 22 grew up with me too but the ones I associated with my teenage years was Cristalle EDP (cos the EDP version was launched when I was 11 or 12 and I immediately asked for it as a birthday present) and Diorissimo as I wore it all through my late teens and early 20s. Right now, I am sampling Chanel No. 19 and I am pretty drawn to the Iris and leather in there. However, I think I am really more of a white flowers kind of girl so I have been wanting to get No. 22 for the longest time. The problem is the only version I can get where I live is the EDT in 250 ml size and only from Chanel boutiques. What versions do you all have and where can I get them? L, thank you! You chose some gorgeous scents to grow up with, that's for sure. I think No.22 is only available now in the large bottle of EdT you mention. I've heard that the parfum is available in Paris, too. Chanel stopped selling smaller bottles of EdT over a year ago, but you may be able to find older stock at some department stores or perfume shops. Hey I was wondering if all the Nordstroms in the US carry CHANEL no. 22 or if it was just yours. I tried desperately to search for it on Bergdorf, Neiman Marcus, Nordstroms, Macy and Bloomingdales's sites but I didn't manage to find it! Perhaps because t is only available in store? And I would also like to know how much the EdT costs if possible…before I venture from my hometown of Vancouver, Canada over to Seattle to search for it. Thanks!! I think that more department stores–such as Nordstrom–used to carry No. 22, but fewer do now that it's become one of Les Exclusifs. I do know, though, that the Nordstrom in Seattle carries Les Exclusifs, so you might try calling there for the price and availability. I love trying a perfume and thinking it isn't “me” at all, and then being surprised at how much I like it! I haven't tried it, but I bet the No. 22 parfum is heaven itself. Have fun in Paris. What a shame! I'm surprised that someone doesn't carry it. I have managed to get a sample of the EDT and I am loving this! Looks like it is going to be in constant rotation with Cristalle, Diorissimo, Apres l'Ondee in my fragrance wardrobe. I was at Saks Fifth Avenue last Fall on Manhatten and they were selling the 200 ml EDT at $150 (or it could be $175) though I didn't get it then. I suppose one can try Saks if there is no Chanel boutique in near proximity. No. 22 is kind of elusive but it is worth the while locating it. It is gorgeous and looks like this is going to be my signature for a while. You like the classics! Really, considering how large the bottle is, the price isn't so bad. Enjoy it! Yes, I adore the classics! They are so evocative and always seem to have a story to tell, unlike the new ones which are just made to smell like long-lasting deodorants or worse, air fresheners! Unfortunately, I'm sure Diorissimo EDT is a sad shadow of its former self but I can't seem to get my hands on the parfum unless I make a fragrance pilgrimage out of my continent. I even have to get many of my classic Guerlains whenever I travel to Europe. I live in the Asia Pacifc region and being only 26, I suppose I'm the only one amongst my peers to actually take any effort in hunting down any classic fragrances since most of them will not be in the local stores anyway. And it is awfully true that the fruity, lightweight and characterless pink scents tend to be very popular here. Really thankful for blogs like this one, else I can very well forsee myself smelling like everyone else. Thanks again for this wonderful review, without which I won't even have found out about Chanel No. 22! I really like the perfume blog community, too, because it links me with other people who understand what perfume is all about. I'm with you 100% about “characterless pink scents”, and I love the classics, too. I just tried No. 22 for the first time today and wanted to share my impressions… some background: my mother was a No. 5 girl who was appalled by my interest in big white florals. (When I was a teen, she vetoed my choices of Sand & Sable AND Coty Muguet de Bois before allowing my grandmother to give me a bottle of Chloe. Which I didn't like, but hey, it was perfume, and I wore it.) I'm still a White Floral Girl who adores Songes, OJ Frangipani, and DSH Tubereuse. So when I began testing classic Chanels I saved No. 22 for the last, because of the four I was testing, I thought I'd love it the most. Surprisingly, I didn't. I generally love sweet, warm florals. I kind of like aldehydes — I don't tend to seek them out, but they're never a problem for me — so I began to enjoy the phase where the aldehydes melt into the heart florals, getting sweeter and warmer every minute. Except that the florals didn't stop getting sweeter… for a good twenty minutes, I felt as if I were wearing that mixed drink that contains simply whiskey, soda and sugar (what is that? I can't remember what it's called… college was a loooooong time ago). I didn't really start to enjoy No. 22 until well into the drydown, when the florals are mostly gone and the incense clings. I was so disappointed in No. 22. It may be that my skin chemistry is amplifying the sweetness, but BOY, was it sweet! I think I have cavities in my back teeth now. It's a beautiful scent with good bones — like all Chanels, it is elegance in a bottle — but I don't think I'll ever be able to wear it. Well, Bois des Iles and No. 19 are a great haul, in any case. I know what you mean about No. 22, though. I don't find it particularly sweet, but it's so innocent, somehow, and heavily aldehydic (even though those two words don't seem like they should go together). This was my first signature scent. I, too, was a young woman at a Chanel counter and of course, the hyped scent was No5. I found 5 cold and uninteresting (I have since had a change of heart but it has not replaced my love of 22). 19 did nothing for me. I had the Eau de Toilette for many years and it had staying power when applied. I loved the intense floral up front, but the best is the soft, warm incense later. I also have the perfume, and it is divine. Same scent, but longer lasting, and the incense is just wonderful! I heard rumors it has be reformulated in the Exclusifs. Any one know the truth? I’m sure it’s been tinkered with over the years–pretty much everything has. It seems like Chanel has done a great job with reformulations, though. I am not one to chase vintage fragrances because I know my weaknesses, far too dangerous. No. 22 however is one that I can comment on to some degree, it having been my first Chanel as a young university student in 1977, yes far past its original issue date but still long ago . . . sigh. Anyway, I’m only chiming in on this because I received an exclusifs sample of it yesterday and to my nose it is identical to the one I had in ’77. So I just want to say “in your face Dior” If Chanel can almost identically reproduce their scents from yesteryear, then so could Dior, if they could only take their eyes off the bottom line long enough to read the ingredients! Of all the designer houses, Chanel still reigns supreme when it comes to the integrity of their formulations. There are so few perfume companies that are privately owned these days. They all seem to be run by behemoths like LVMH who, by the sad decline of their products, keeps tightening the budget for materials (while spending gazillions on marketing). I hope Chanel stays family owned forever. Can anyone comment on the differences between the EDT and Extrait of No. 22? The extrait is newly available on the US website and I’m curious. I’m sorry I can’t help you there. Boy, I’d love to smell the extrait! This is it, my one and only! I discovered her on a winter day in SF and it was love at first sniff. 22 evokes a sense that is simultaneously melancholic and happy. She is a wintry mystical haze ..a whiff of a bridal dress stored in a chest ..a walk through a European cathedral ..an addictive scent from which emanate delicate white flowers, aldehydes, and incense all working harmoniously to deliver an inhaling experience that is old world and otherworldly. This thing loves my skin and I wear it for me ..lucky are those who walk right past me mmm I never want to part. Oh please, Chanel, never deprive us of this beauty. Oh, lucky you to have found a fragrance that resonates with you so much! You smell wonderful!